A team of scientists from the UK (University of Warwick) and Canada (York University) have demonstrated a system to code any generic message into evaporated alcohol molecules. 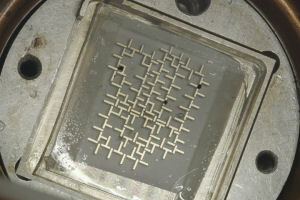 The researchers believe their molecular communications system, which works in a similar fashion to how animals communicate with pheromones, could be used for the transmission of messages and data in challenging environments where electromagnetic waves cannot be used, for example in underground structures such as tunnels, pipelines, or in underwater environments. The first demonstration involved sending some of the Canadian national anthem across an open space of several meters before it was decoded by a receiver. The hardware, according to a report in the journal PLOS ONE, is made from off-the-shelf electronics and costs around $100. The transmitter is controlled by an Arduino Uno open-source electronics prototyping platform, which converts the text message to a binary sequence. 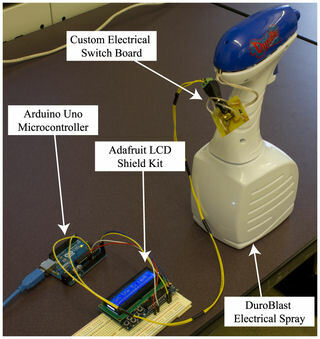 To modulate the binary code into chemical signals, the researchers used an electronic spray called DuroBlast that can disperse a wide variety of liquid chemicals – in this case alcohol. 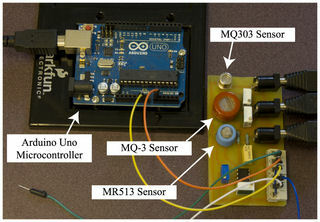 The receiver is also controlled by an Arduino Uno open-source microcontroller, while detection is performed by three different off-the-shelf alcohol sensors. All three sensors use a metal oxide semiconductor detection layer for detecting the alcohol, but each has a different sensitivity, power and operation circuit diagrams. Demodulation was performed by measuring the rate of change in concentration of alcohol. If during a single bit’s communication session the voltage reading from one of the sensors is increasing (i.e. the concentration of the chemical signal is increasing), then the signal is demodulated as the bit 1. Similarly, if the voltage reading from one of the sensors is decreasing (i.e. the concentration of the chemical signal is decreasing) the signal is demodulated as the bit 0. At one bit per 2 seconds the transmission was found to be unreliable at small distances of up to 2 meters. At the rate of one bit per 5 seconds, the transmission was very reliable over various distances from 1 meter to 4 meters. The researchers say that the smallest transmission rate that is reliable at distances up to 4 meters is one bit per 3 seconds.